I think soup has gone through many revivals over the years. I remember my mother making soup from chicken or turkey carcasses or as a treat we had Heinz tomato soup. This saw an increase of packets and cans of soups of many varieties and tastes some memorable and some best forgotten. Then came the gourmet soups along with of course a higher cost to the consumer. Some very tasty. But I think this also prompted a revival amongst cooks to recreate these in their own kitchens and we have been treated to some marvelous soups from around the world. 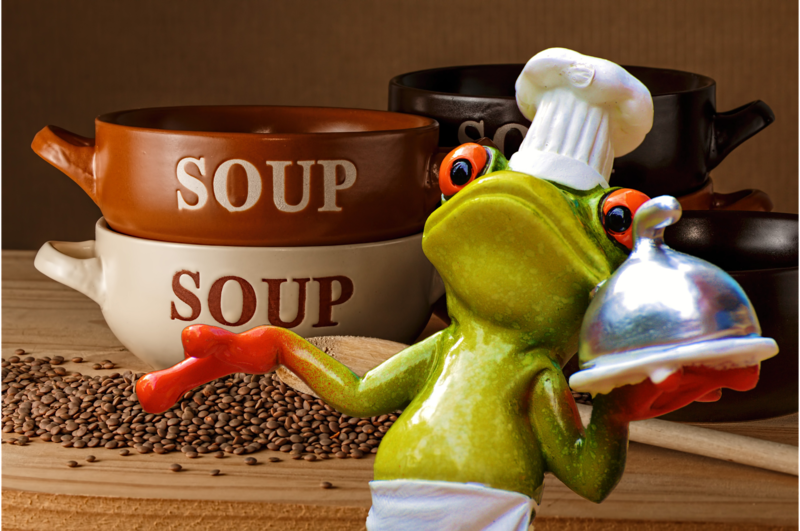 Ingredients we have never tried or thought to add to our soups but it has opened up a whole new world of soups. Many of you are experiencing icy cold temperatures so I have put together a few soups which will help warm those tummies and hopefully help to keep away those nasty bugs and which are also easy to make. For those of you who are experiencing warmer weather some soups as well as no matter what the weather I enjoy a bowl of soup. Don’t you??? I have many happy memories of the luscious soup my mum used to make with the leftover turkey carcass. Do you???? N.B. You can use any vegetables which you have available. Sometimes I add some Swede or turnip it depends on what I have, anything goes sweet corn, I add noddles or bean sprouts, just some examples. What do you use????? In a large pot put the chicken carcass and cover with water add your roughly cut carrot, onion, a bay leaf and thyme sprig bring the water to the boil reduce heat to very low and simmer for 2 hours. Take the turkey bones out of the pot and pick off any meat. If required chop the meat and reserve. Throw away the bones and strain the broth through a fine sieve reserving the liquid and discarding the cooked vegetable. In a clean soup pot add the strained broth add the remaining raw chopped vegetable carrot, onion, celery, potato, cabbage) parsley, barley, and simmer for an hour until the vegetables are tender. Adjust seasoning and add Worcestershire sauce if using. My mum would sometimes add dumplings or we would eat with fresh crusty bread. It is a lovely soup basically using leftovers and my kids still love this and remind me sometimes of their memories of eating this soup. Pumpkins or Squash is available everywhere and makes a lovely soup. This is one of my favorite recipes and I know that ingredients like shrimp paste can now be bought in Asian stores around the world or purchased online. This Pumpkin soup can be served in small individual hollowed out pumpkins for a special occasion. 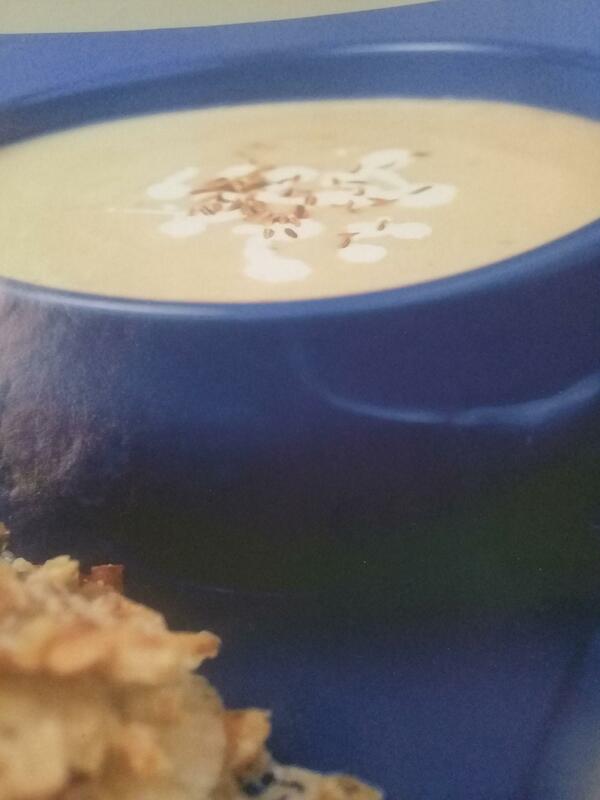 The soup will be then sure to bring some Oohhs and ahhs from your guests. 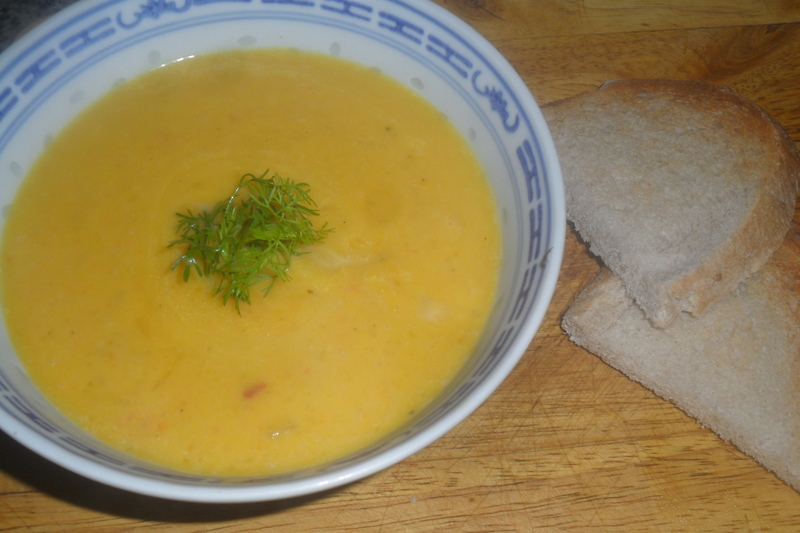 You can also use crab meat instead of prawns or use them both for a pumpkin seafood soup. The recipe will serve 4 persons. Dill to garnish or sometimes I use fresh basil leaves. Pound the peppercorns and coriander roots to a smooth paste. In a large saucepan, over medium heat, stir fry peppercorn/coriander paste, pumpkin, lemongrass, onions, and shrimp paste for about 3 minutes, stirring constantly. Cover the pan with a lid and cook on low heat for about 20 minutes, stirring occasionally. Transfer the mixture to a food processor and blend with shrimp stock until smooth. Pour it into the saucepan, add coconut cream and bring to a slow boil. Then, on low heat, add the seasoning: lime, chili paste, fish sauce, sugar. Mix well, add prawns, and cook for 1 to 2 minutes. Taste to see if any extra seasoning is required, and then remove the pan from the heat. Just before serving, Garnish with a sprinkle of dill leaves. N.B. On a recent trip to the UK, my son found coconut milk was not 100% as it is here where I live. If you can only get a coconut milk which is not 100% then do not boil as it will separate just slowly bring it to a soft boil. Who would have thought that Brussel sprouts would make such a lovely soup? It can be served with some crispy garlic bread or some lovely Stilton wafers and as I had some cheese left over from Christmas. It was Stilton wafers and they were yummy. 300g Brussel sprouts trimmed and roughly chopped. 1 large potato cut into dices. 4 tbsp of double cream. Heat the oil in the pan and fry the onions, garlic, and potato for 5 minutes. Sprinkle in the fennel seeds, then fry for 30 seconds. Add the sprouts and fry for 2 minutes add stock and bring to the boil. Season, cover and simmer for 15-20 minutes until the potatoes are soft. Meanwhile, Heat the grill to high crumble the stilton in a bowl and stir I the breadcrumbs and walnuts. Line a baking sheet with parchment and place 8 piles of the mixture onto it. Remove the soup from the heat and blitz in the food processor. Return to the pan and add the nutmeg, reheat gently. Ladle into 4 serving bowls and swirl/drizzle with the cream. Sprinkle with extra fennel seeds and serve with your stilton wafers. I hope you enjoy these soups. 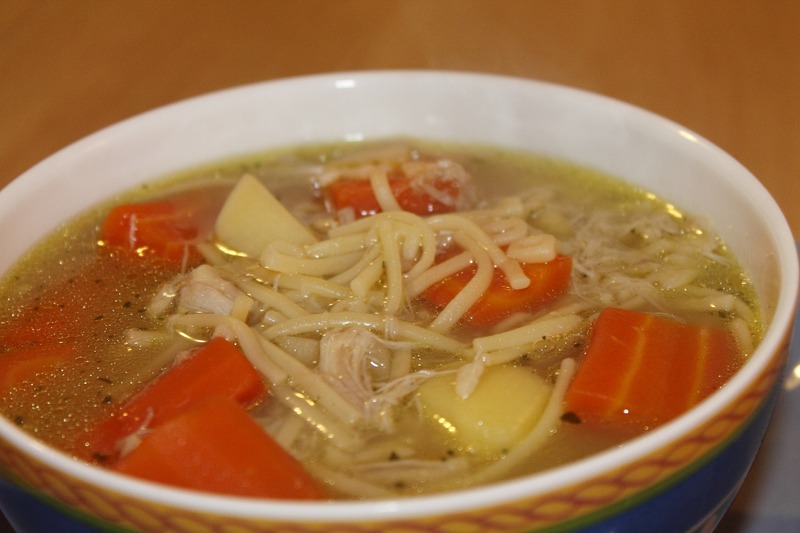 What are your favorite winter warming soups? I would also like to wish you all a very happy and healthy New Year and also thank Esme for letting me loose on her lovely blog. My dear Carol. Thank you from the bottom of my heart for sharing your awesome posts with us monthly. I am so honored and privileged to have you share on such a regular basis. I appreciate one and all of these most delicious recipes you share with our readers. Thank you again.. And just the weather for some warming soup..
And yes, That Turkey was meant to last and last. And I can almost taste it.. Your images are very good and mouthwatering..
Hi Sue, thanks for visiting and as Carol said, one can not have enough soup recipes and thanks for saving this page. Please feel free to also join the FB Page where you can also find some awesome recipes from this group. https://www.facebook.com/CookwithTheRecipeHunter/ Would love to see you there as well. This is one of my favorite kinds of soup to make. I don’t eat potatoes so I will sub parsnips or cauliflower! Soup, wonderful winter warming and hearty soup, any day of the year, not winter time, I love it. Always a treat. I love the Viking soup as we tend to do that as well.